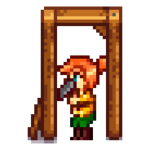 2019-03-07 19:45:05 Margotbean에 의해 마지막으로 편집 됨.
Shane is a villager in Pelican Town who is often rude and unhappy, and suffers from depression and alcohol dependence. However, his attitude starts to change towards any player who chooses to befriend him. He works at JojaMart most days between 9 AM and 5 PM, and after work he frequently spends his evenings in The Stardrop Saloon. He doesn't work on the weekend except on rainy days, and is frequently around the ranch. In the Social Status menu, Shane's outfit will change to a Joja Corporation uniform when he is at his job at JojaMart. He's one of the twelve characters available to marry. If it is raining, Shane will go to work at JojaMart on Saturdays or Sundays, if the Community Center is not complete. He will also go to work at JojaMart until the day after completing the Community Center. Otherwise, he is usually found at The Stardrop Saloon in the evenings. 7:10 AM Leaves Marnie's Ranch and heads to JojaMart. 5:00 PM Leaves JojaMart and heads for the Stardrop Saloon. 11:10 PM Leaves the Stardrop Saloon and heads back to Marnie's Ranch. 9:00 AM Leaves his room and stands in kitchen at Marnie's Ranch. 12:00 PM Leaves Marnie's Ranch and heads to Pierre's General Store. 5:00 PM Leaves Pierre's General Store and heads to the Stardrop Saloon. 11:00 PM Leaves the Stardrop Saloon and heads back to Marnie's Ranch. All Day Standing in kitchen at Marnie's Ranch. 11:00 AM Leaves the kitchen and returns to his room. 12:00 PM Leaves his room and stands by the fireplace at Marnie's Ranch. 2:00 PM Leaves Marnie's Ranch and heads to the Stardrop Saloon. Although Shane is supposed to attend the Night Market, there is a bug in v1.3.32 which prevents him from attending. Instead, he stays inside Marnie's Ranch all day. If JojaMart is still open, he will not attend work that day. 9:00 AM Standing in kitchen at Marnie's Ranch. 12:00 PM Leaves Marnie's Ranch and heads for Pierre's General Store. If the community center is restored, Shane doesn't leave The Farm except on Monday and Friday. On Saturday mornings he spends time next to his chicken coop behind the farmhouse. 9:30 AM Starts leaving home. 10:30 AM Arrives at Marnie's Ranch. 11:30 AM Leaves Marnie's Ranch. 11:50 AM Stands under big tree, north in Cindersap Forest. 05:00 PM Leaves big tree and heads home. 07:30 PM Arrives at home. 8:30 AM Leaves home and heads for the river in Pelican Town. 10:00 AM Standing by river. 1:00 PM Leaves the river and heads to Pierre's General Store. 10:00 PM Leaves the Stardrop Saloon and heads back home. Shane lives at his aunt Marnie's ranch with his goddaughter Jas. He works at JojaMart (unless the Community Center is completed), and Morris is his manager there. 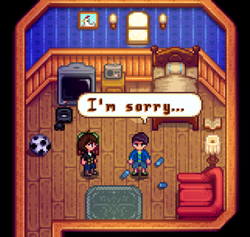 Note: Shane's relationship with Jas is revealed in only one place in the game: a rare dialog from Jas that occurs only on Sundays. You can give 셰인 up to two gifts per week (plus one on 그의 생일), which will raise or lower 그의 너와의 우정. Gifts on 그의 생일 (봄 20) will have 8× effect and show a unique dialogue. At any friendship level greater than zero friendship points, you may receive a gift in the mail from 셰인. The chance of receiving a gift in the mail increases as your friendship with 셰인 increases. I thought it would be fun to send you a letter. I don't really know what to write, though. Here, I've enclosed a treat for you. Don't tell anyone, but I snagged this from the back room of JojaMart ages ago. Enter Cindersap Forest between 8pm and midnight. 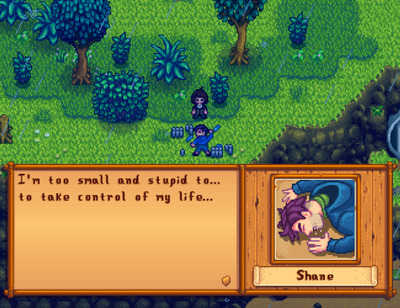 Shane shares a beer with the player, on the dock of the small lake, and describes his depression. He expresses optimism for the player's future and warns against drinking heavily. The player ends the event with the "Tipsy" condition. After reaching 3 hearts with Shane, he will send you two recipes in the mail. He will also become slightly less rude to you during dialogues. Strange Bun I found this recipe in a magazine and I thought it sounded interesting. Feel free to give me a taste if you make it. hehe. After reaching four hearts with Shane, his dialogues with you will become more friendly. Enter Marnie's Ranch at any time. Shane is found passed out in his room, surrounded by empty beer cans. Marnie asks you to do something, so you use your watering can on his head to wake him up. Marnie remarks that all he does is mope around and drink beer. When Marnie asks him what his plans for the future are, Shane says that he hopes he "won't be around long enough to need a plan." Jas overhears and runs away crying; Marnie follows her while Shane looks at the ground and murmurs an apology. Enter Cindersap Forest between 9 am and 8 pm while storming or raining. "Because there's so much to live for!" (우정에 영향을 미치지 않습니다) "Maybe for you, but not for me! You're not going to understand... Just... go away. ...Ugh..."
"Jas needs you. You're like a father to her." (우정에 영향을 미치지 않습니다) "...You're right. Jas... Ugh, God... I'm a horrible, *hic*... selfish person. Now I feel even worse..."
"It would be a sin." (우정에 영향을 미치지 않습니다) "Yoba...? (Player), don't you know I'm an athiest? Ugh..."
"The decision is your own. Just know that I'm here for you." (우정에 영향을 미치지 않습니다) "Thanks... I appreciate that... I really do." Regardless of your choice, you take him to the hospital. Harvey treats his physical ailments but is more concerned about Shane's mental health. He tells you that he's going to recommend Shane to a counselor in Zuzu City once he wakes up. "I'm glad I was there to help." (우정 +10) "...Yeah, me too." "You needed a serious wake-up call." (우정 -10) "I know... That's why I stopped by, to tell you about it." "I'm just happy you're still here." (우정 +10) "Wow, it was that serious, huh? I can hardly remember..."
Enter Marnie's Ranch while Shane is home after triggering Shane's six heart event. Shane enters the ranch, where Marnie is standing behind the counter. He tells her that he's been feeling happier than usual. Jokingly, she asks if there was a sale on beer. Though slightly annoyed, he responds by saying he's started drinking sparkling water instead. He then says that he's realized that he has people that he can rely on and that doing so doesn't make him weak. He walks over to Jas, who is in the kitchen, and gives her a present. She opens it to find a pair of expensive shoes that she had wanted. When she asks Shane how he could afford it, he replies that it's because he cut back on his expensive habit of drinking beer. You will find Shane filming a scene starring Emily and Clint. Shane will explain to you that Joja is holding a contest to create an advertisement for the newest Joja Cola, and the winner gets 10,000골드. He will ask you to walk behind Clint and Emily as they act so the scene feels more natural. When it's over, he will thank you for helping him. * This event was Shane's six heart event before update 1.1. Enter Marnie's Ranch while Shane is home. When you enter the ranch, Jas leads you through the door in the kitchen that is normally locked. Inside, Shane is painting a sign that says "Fresh Eggs." He's surrounded by his flock of special blue chickens and his favorite white chicken, Charlie. Once he finishes painting the sign, he picks up Charlie and briefly talks to her about his ambitions and his struggles. When you and Jas enter the room, Shane talks to you a bit about how he is trying to pass on the chicken knowledge to Jas so she can continue the tradition if he ever moves out. After seeing this event, each chicken that the player purchases from Marnie and each egg that hatches in the incubator now has a 1/4 chance of being blue. Aside from appearance, the blue chickens are identical to white chickens. Exit your house before 6:30am to initiate the event, then walk to the Bus Stop between 4pm and 6pm. "Noisy... It makes me appreciate how peaceful it is back home." (우정에 영향을 미치지 않습니다) "Oh yeah? I guess that makes sense. Me? I get bored with Pelican Town sometimes. But... I like that you're different. We balance each other out." "Fun... Pelican Town seems really boring in comparison." (우정에 영향을 미치지 않습니다) "Oh really? I'm surprised... Didn't you move to Stardew Valley to escape the noise of the city? I mean... Don't get me wrong, I totally understand. My life in Pelican Town is pretty bland, you know." His attention returns to the game when the Tunnelers make a play and score a goal. In a moment of excitement, Shane gives you a kiss, but then he feels embarrassed by it and apologizes for getting carried away. After a pause, you reply with a kiss and allay his fears. The scene fades out and Shane briefly reflects on the evening. Once married, Shane will move into the farmhouse. Like other marriage candidates, he will add his own room to the right of the bedroom. He'll also set up a small chicken coop behind the farmhouse, where he'll sometimes go to visit with his chicken "Charlie". 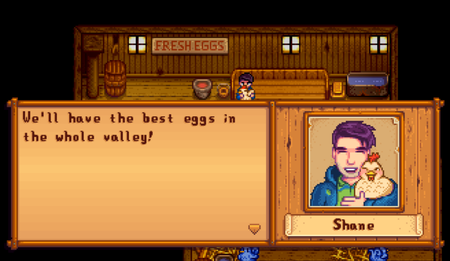 On rainy days, Shane may offer you Beer, Large Egg, Pale Ale, Void Egg, or Pepper Poppers. On days when Shane stays inside the farmhouse all day, he may offer you Omelet, Pepper Poppers, or Pizza. Shane with his chicken "Charlie"
셰인 may randomly request an item at the "Help Wanted" board outside Pierre's General Store. The reward is 3x the item's base value and 150 Friendship points. Shane's look evolved over the years the game was in development. Here's a timeline showing how ConcernedApe's art and Shane's style changed over the years before the game was launched. Judging by the 'Mega Station' console in Shane's bedroom, he is a gamer. Additionally, it is hooked up to a 'Code Sultan XL'. 1.1: Added ability to marry, updated heart events, dialogue and schedule. Added a private room for him at Marnie's Ranch. 1.2: Changed 6-heart event dialogue response. 이 문서는 2019년 3월 7일 (목) 19:45에 마지막으로 바뀌었습니다.